Genea-Musings: Treasure Chest Thursday #303: 1735 Birth Record of Patience Hamant in Medfield, Mass. Treasure Chest Thursday #303: 1735 Birth Record of Patience Hamant in Medfield, Mass. Vital Records of Medfield, Massachusetts to the Year 1850 (Boston, Mass. 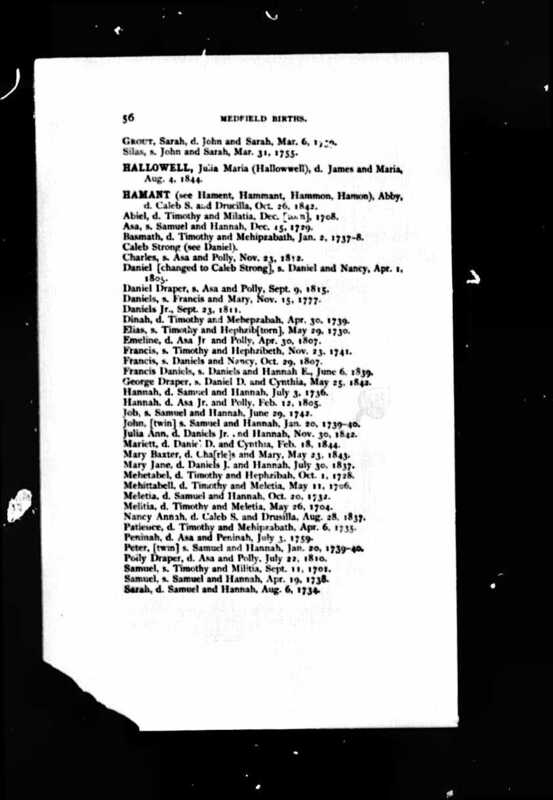 : New England Historic Genealogical Society, 1903), Births, page 56, Patience Hamant entry. Patience was the daughter, and the 5th of 9 children, of Timothy Hamant and Hepzibah Clark, who married in 1727 in Boston. The spelling of Hepzibah's name is quite variable. In the birth record for Patience, she is called "Mehipsabath." I can imagine her being called "Heppy." Patience Hamant (1735-1780) married Moses Smith (1732-1806) in 1762. They are my 5th great-grandparents through their son, Aaron Smith (1765-1841).